Agua Amarga (Bitter Water) is one of the prettiest villages in the park, with a fairly small population center and the hills surrounding the town are dotted with white houses of careful architecture. Walking through the streets of the town, especially around the square, you can find some fashion and accessories stores, "chic" style, highly recommended. Also noteworthy in this village is the lush greenery on terraces and balconies, or the amount of trees near the beach, taking into account the climatic conditions of the area. The beach is perfectly aligned with the town, to create a fantastic combination in terms of accessibility and beautiful views. There is no Promenade to separate the beach from the town and you can park almost directly on the beach, on the Rambla (dry river bed). Agua Amarga is near the promontory of the Mesa Roldán, where you can visit an ancient volcanic dome on top of which there is located a watchtower and a lighthouse. From this point the Agua Amarga views, beaches and coves are impressive. If you want enjoy a virgin beach you must visit Playa Los Muertos (Beach of the Dead), a magnificent beach where access is by a path and not accessible for people with disabilities. Agua Amarga has one convenience store, Komo Komo, closed between 2-5 pm. There is no bank, but in the summer there is an ATM in the Parking Square. On Wednesday mornings there is a Health Clinic, held in the Post Office. The nearest gas station is in Carboneras (see below). Another gas station is located at the junction of the A7, exit Carboneras (494). There you can also find a Michelin car repair shop. The nearest garage is the Renault Dealer in Carboneras. 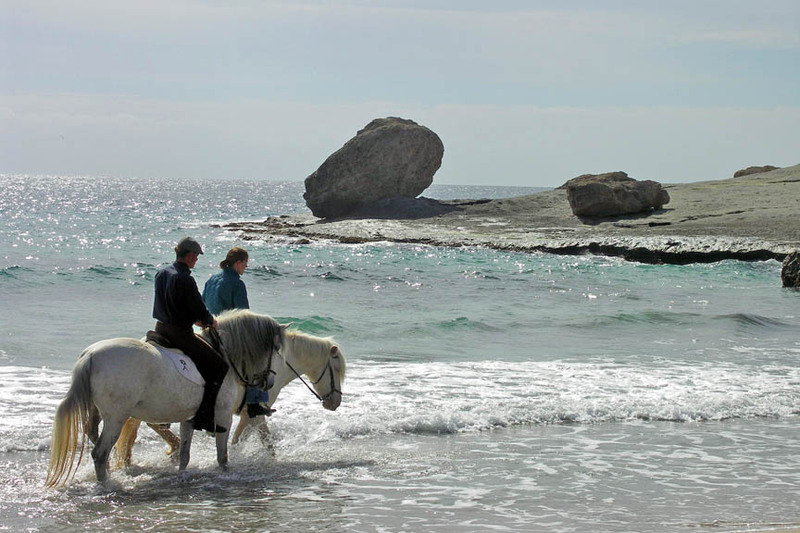 Hípica Aguamarga is situated at La Joya de Agua Amarga, only 1.5km (0.9 miles) from the centre of the village and the Mediterranean Sea, next door to Finca los Tigres. The Hípica comprises three stable blocks, a Picadero (riding ring), a 20x40 riding manege and large fenced in fields for controlled outdoor riding. 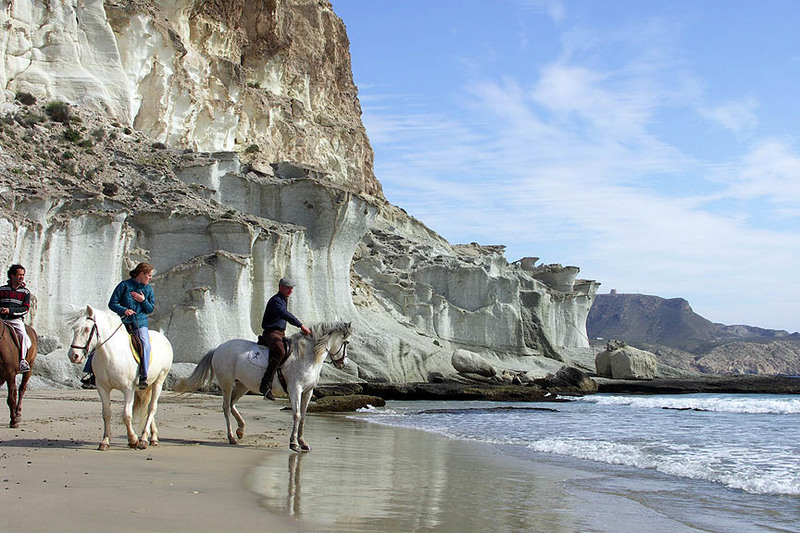 From the Hipica various bridle paths lead to nearby beaches, through canyons reminiscent of the Wild West. The buildings are brand new and of the highest quality. They are always exemplary in appearance and cleanliness, as are the horses. And for non-riders there is a pleasant bar area to wait for the riders, have some refreshments or get out of the sun. The Hipica has a variety of horses, donkeys and ponies but they are all calm, friendly, sturdy and sure-footed, perfect for trekking and riding on the beaches: they love to swim, too! You are welcome to help groom them and make friends with them. When they are not working they will be out grazing right underneath the terraces of Finca Los Tigres and you can follow your horse as he or she plays with the others. Carboneras has traditionally been a fishing village, and although the economic importance of fishing is still very important, it has been transforming its business model towards tourism and industry (the desalination plant of Carboneras is the largest in Europe). With a large variety of dining, Carboneras is chosen by many of our guests for eating out: the promenade and the High Street (Calle Sorbas) have a wide variety of restaurants with terraces where to eat or drink while admiring the beaches and the sea. The old part of town is nicely restored and boasts many restaurants and shops. The ancient market place in front of the St Andres Castle has been restored and shows ancient Roman amphoras, preserved during the dig. The Castle itself has reopened after extensive restoration and is definitely worth a visit. Carboneras has great Fiestas, for example the Fiesta de Virgen del Mar and the Fiesta de San Antonio. Horse riders in traditional dress will ride the street and singing and dancing goes on into the small hours. Check for dates with the Tourist Office. Practical Notes:The Thursday morning market is legendary! Carboneras has pharmacies, clinics, banks, supermarkets, a post office and internet cafes. The MERCADONA supermarket sells everything you can possibly want. There is a large Gas Station just outside Carboneras on the road to Almeria. Agua Amarga, Cala Enmedio, Cala de Plomo and Los Muertos, each with their own individual characteristics. With more than sixty golf courses in Andalucia and numerous more to the north in the region of Murcia, several are within easy reach of Agua Amarga. The closest is known as El Cortijo Grande Club de Golf and is located at Turre, near Mojacar, approximately 45 minutes by car to the northFurther up the coast, near Murcia (approximately two-and-a-half hours' drive) is the world famous La Manga Club, which not only offers golf but a whole range of other activities including tennis, football, mountain biking and even crazy golf! The Sotogrande golf club is located near Malaga (four hours by car from Agua Amarga) but if that seems a little too far for a round of golf, why not try Europe's one and only desert golf course, at the luxurious Desert Springs Golf Resort, only two hours' drive away? Agua Amarga has a long history of fishing, with local fisherman landing their catches most mornings on the beach, when fish can be bought directly from their boats. Visitors may fish themselves in and around the rocks enclosing Agua Amarga beach, for dorada, sea bass, pulpo (octopus), tuna and many more species. During the summer months swordfish can be easily found. Fishing is available to everyone, with most marinas in the area offering all the facilities required. Please be aware that licenses are required before taking part in fishing however these are easily available. For salt water fishing you will need to visit the Delegación Provincial de la Conserjeria de Agricultura y Pesca and for fresh water fishing the Delegación Agencia Medio Ambiente (AMA). Offices for both can be found in the main provincial cities, including Almería. Licenses are also available from branches of the Caja Mar bank. You will need your passport for identification purposes. An excellent guide book entitled ‘Sports Fishing’, published by Turismon Andaluz is available from Tourist Offices. 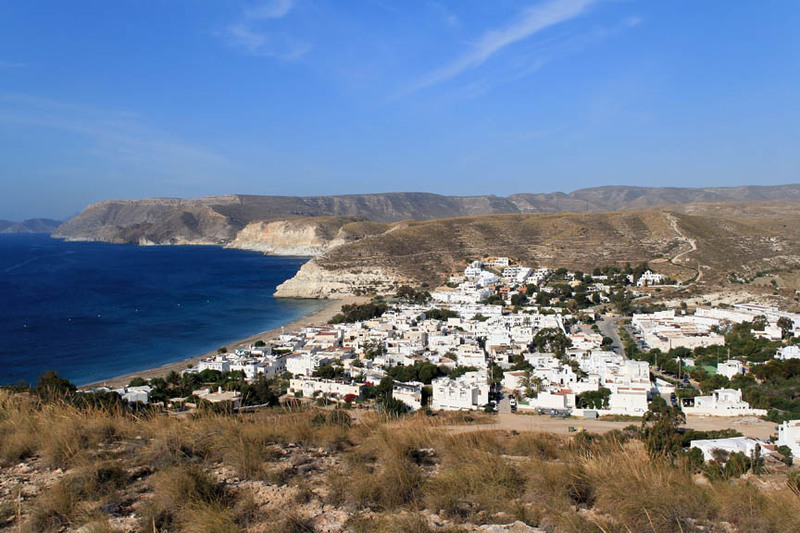 Further away in Adra (west of Almería, an hour-and-a-half in the car from Agua Amarga) you will find a picturesque fishing harbour and small town dating back to the 8th century, offering daily fish auctions at dawn and a multitude of seafood restaurants. Sailing opportunities abound for visitors of all experience, whether just for fun or if you are looking for something more ‘intense’. 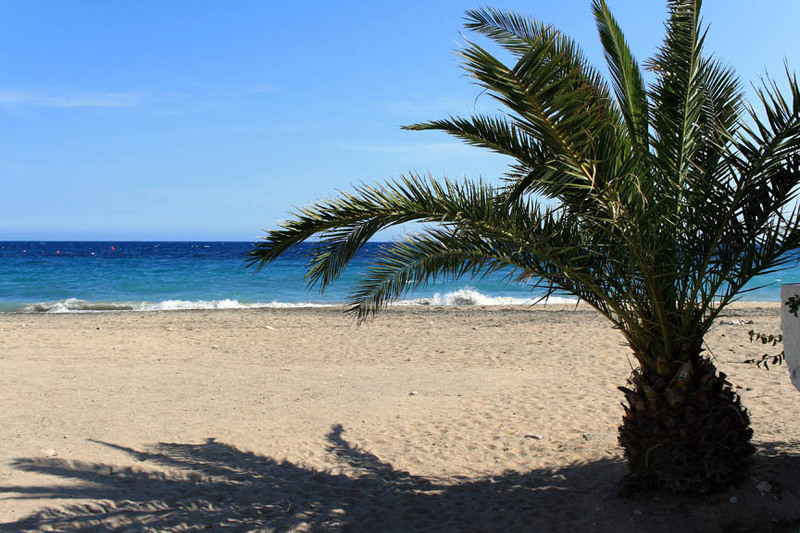 It is possible to hire out motor boats, catamarans and small pedal boats in Agua Amarga. Yacht Club San Andres is under construction at Carboneras and the Club de Mar Almería yacht club is extremely welcoming to experts and novices alike, with excellent facilities for visiting yachts. The club offers superb dining facilities with views of the harbour and the comings and goings of the ferries linking the city with Morocco. Further afield to the west of Almería lies the Almerimar Yacht Club, a vast complex ready to receive, service and repair any size of visiting vessel. The area surrounding Finca Los Tigres and the stables is perfect walking terrain, offering unique (in Europe, anyway) rugged, desert landscapes as well as mile upon mile of beautiful coastline. Sturdy boots, binoculars and an ample supply of water are all highly recommended. Agua Amarga is popular with walkers, painters, botanists and palaeontologists alike, all of whom can be found trekking around the area studying the beautiful landscapes, looking for fossilized traces of ancient life, collecting the many kinds of unique plant life that only exist in the desert, or just taking in the clean, fresh air of the great outdoors. The countryside really is like nothing you’ve seen in Europe before, and the possibilities for a day’s hiking are endless. Sol y Nieve (Sun and Snow) is only about 2 hours drive from the Finca and Hipica. The resort in the Sierra Nevada mountains near Granada hosted the 1996 World Championships and has several ski runs of various difficulties. The resort offers sleek runs, high speed lifts, romantic accommodation and many other activities such as dog sledding and torch light horse carriage rides. Well within reach by car is the provincial capital, Almería, offering a mixture of history and the hustle and bustle of a 21st Century European city. 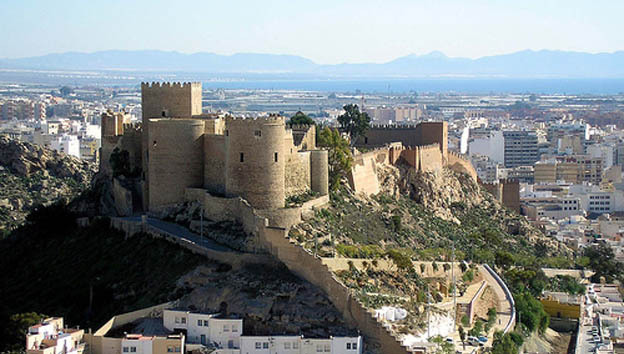 Amongst its many attractions is the must-see Alcazaba fortress, the Almería Museum, ferry trips to Morocco and many local dishes at its numerous restaurants and bars. 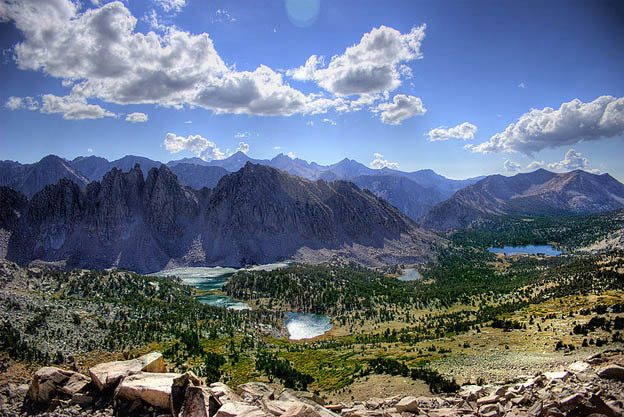 Further afield is the Sierra Nevada mountain range. Europe's most southerly ski resort and the magnificent city of Granada, with its world famous Alhambra, a palace, fortress and beautiful gardens all rolled into one. 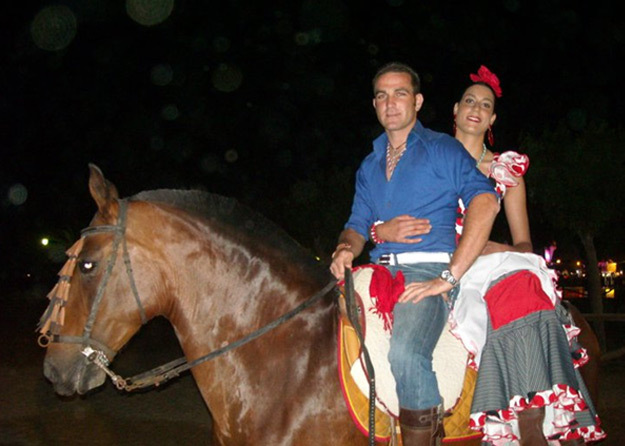 The part of the city is renowned for its fantastic restaurants and authentic flamenco. "The villa is cosy, comfortable and warm and the views breathtaking. I loved the village and the beach, both very tranquil and unspoilt. I want to come back as soon as I can!" I really loved it. Congratulations on your nice house and how well it is kept. In particular, I thought it was such a nice idea with the silk robes and the logo on everything. And what a view !! I also visited Mini-Hollywood, which I found truly amusing. It wasn't all too tacky and with a bit of fantasy you can actually imagine yourself in one of those films. “We thoroughly enjoyed our stay, the luxurious accommodation wanted for nothing, the views were great and the local village and beach were all that we could wish for. We shall certainly be back!" "Vivienda Turistica Alojamiento Rural, accredited by the Consejeria de Turismo y Deporte de la Junta de Andalucia"